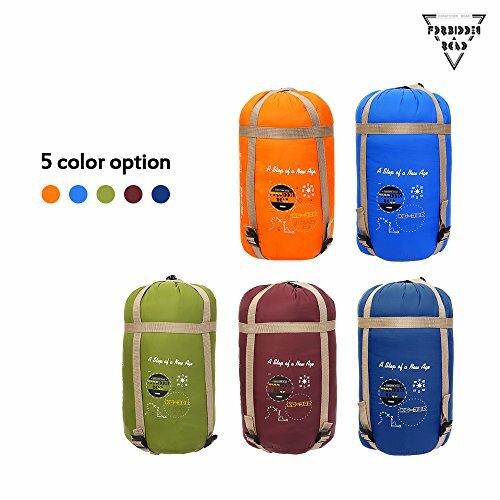 ROOMY FOR 2 PERSONS : The size of double sleeping bag is 59” x 75” (150 x 190 cm), which is double width of single size in the market. 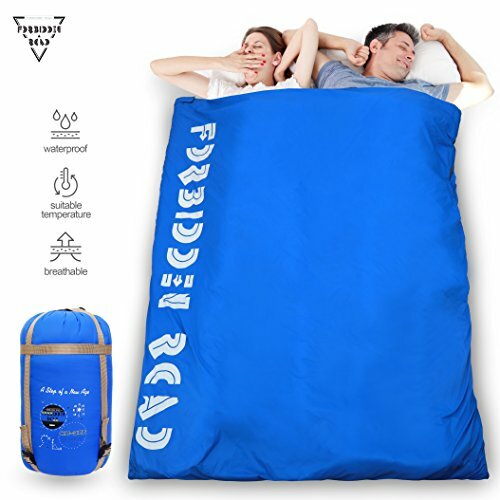 Two persons who sleep in the double sleeping bag will feel roomy and comfortable.Temperature Rating: 15 ℃ / 60 ℉. 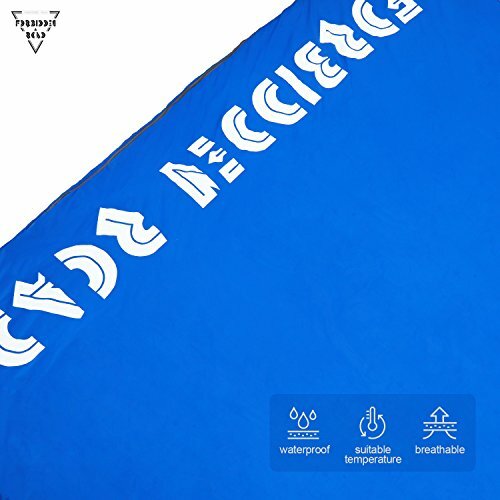 WATERPROOF MATERIAL OUTER & COMFY FABRICS INNER : The material of double sleeping bag is adopted waterproof 380T nylon in the outer, 190T polyester pongee used in the lining. 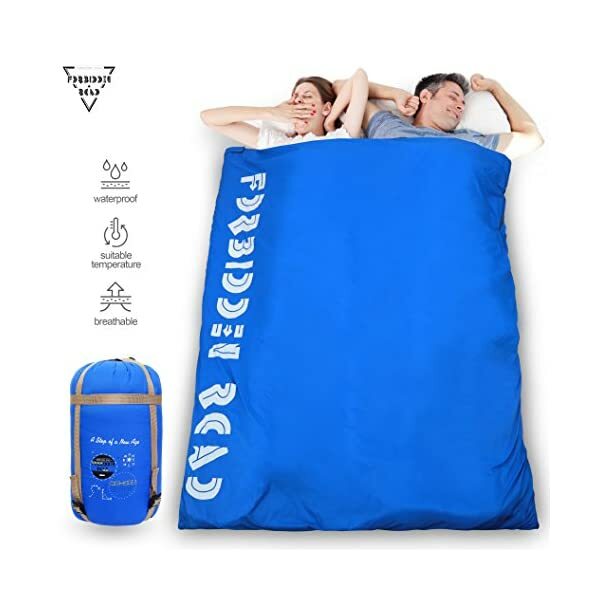 Especial in the inner fabric of double sleeping bag, silky cotton is added as filling, which blocks out temperatures over 50 degrees Fahrenheit. Thus, it makes you warmer in the cool weather (Spring Summer Fall). 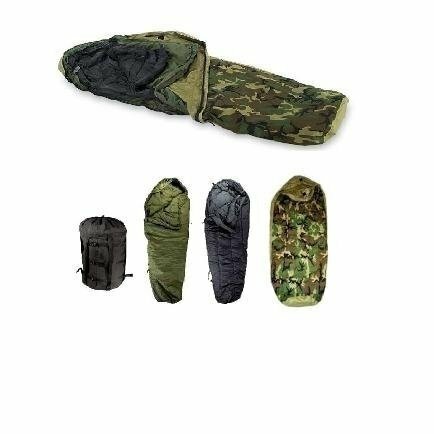 Besides, dual zippers are designed carefully to make sleeping bag more durable. 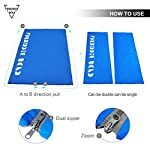 EASY-TO-FOLD : It is very easy to fold / unfold the sleeping bag. 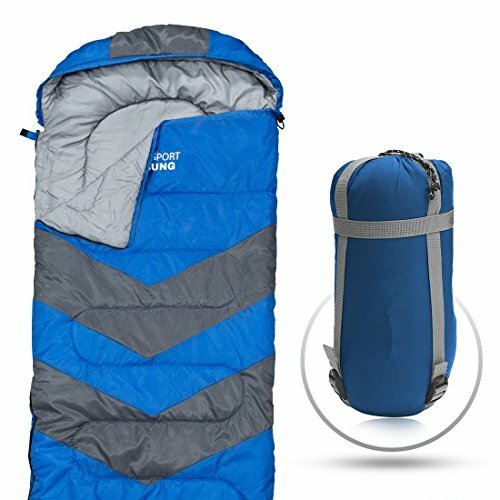 It takes you less than 1 minute to fold / unfold the sleeping bag. The velcro can be found at 4 corners of sleeping bag, which is very useful in folding it. 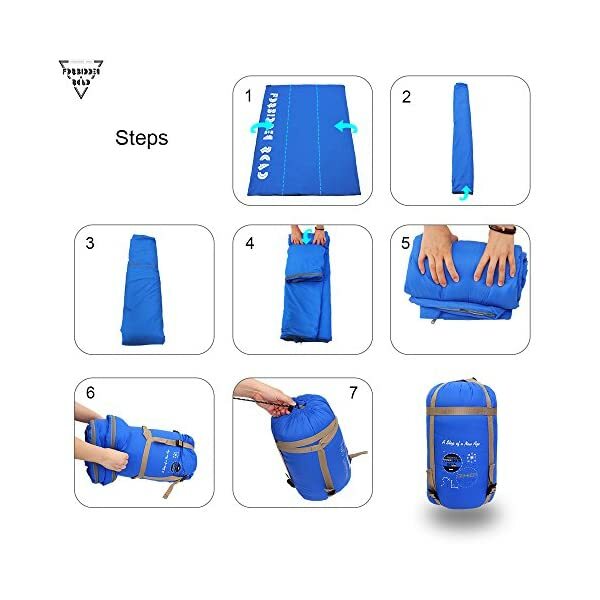 The steps of folding the sleeping bag are shown in the picture. 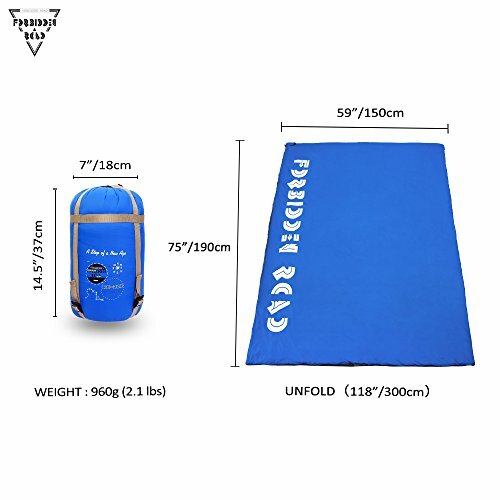 The material of rectangular sleeping bag is adopted waterproof material in the outer, which helps you do away with worry of getting wet even as sleeping in the field. Especial in the inner fabric of double rectangular sleeping bag, silky cotton is added as filling, which blocks out temperatures over 50 degrees Fahrenheit. Thus, it makes you warmer in the cool weather (Spring Summer Fall). 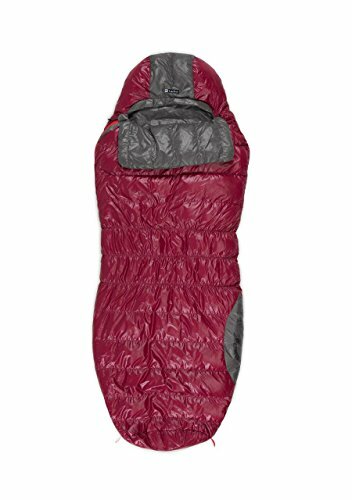 But even so, dual zippers are designed carefully to make rectangular sleeping bag more durable. It is vitally easy to fold / unfold the envelope sleeping bag. 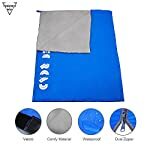 It takes you not up to 1 minute to fold / unfold the envelope sleeping bag. The velcro will also be found at 4 corners of envelope sleeping bag, which is very useful in folding it. 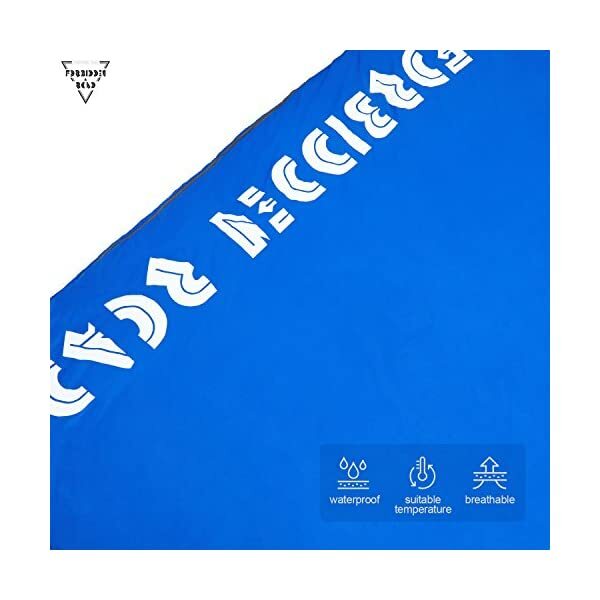 The steps of folding the envelope sleeping bag are shown in the picture. 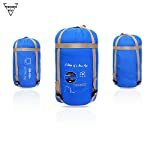 As lightweight of rectangular sleeping bag, it is simple to carry to anywhere. Plus, a free compression bag is included in the package, which is very convenient and portable to take to camping / hiking / trip. We Forbidden Road at all times value the customer user experience. 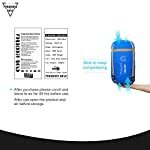 Please kindly leave your feedback and rating on our products below. 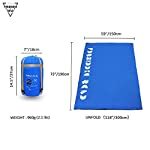 ROOMY FOR 2 PERSONS : The size of double sleeping bag is 59” x 75” (150 x 190 cm), which is double width of single size out there. 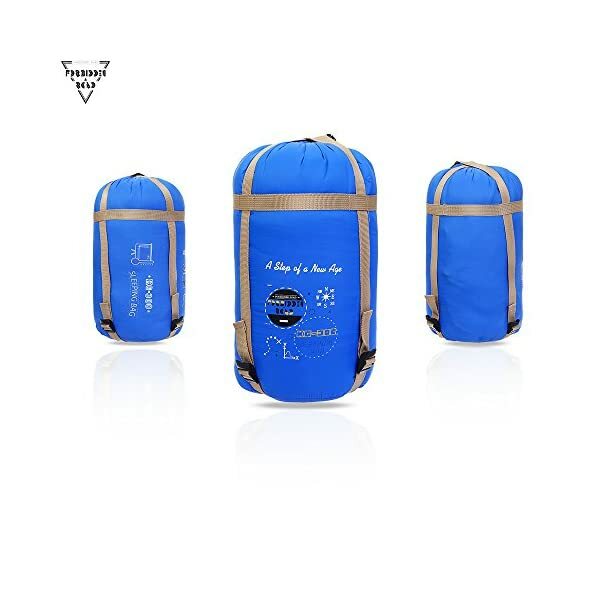 Two persons who sleep in the double sleeping bag will feel roomy and comfortable.Temperature Rating: 15 ℃ / 60 ℉. 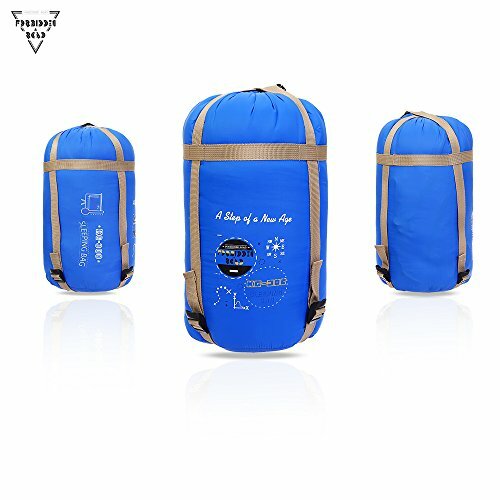 WATERPROOF MATERIAL OUTER & COMFY FABRICS INNER : The material of double sleeping bag is adopted waterproof 380T nylon in the outer, 190T polyester pongee used in the lining. 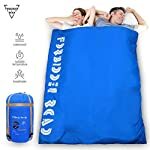 Especial in the inner fabric of double sleeping bag, silky cotton is added as filling, which blocks out temperatures over 50 degrees Fahrenheit. Thus, it makes you warmer in the cool weather (Spring Summer Fall). But even so, dual zippers are designed carefully to make sleeping bag more durable. 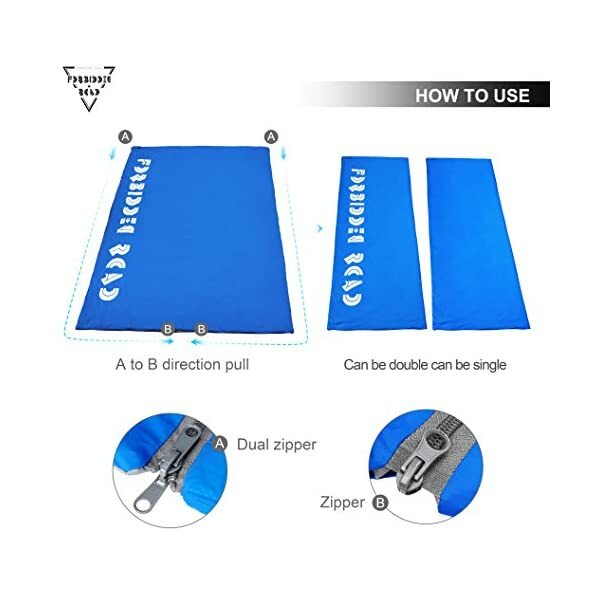 EASY-TO-FOLD : It is vitally easy to fold / unfold the sleeping bag. 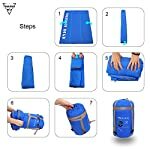 It takes you not up to 1 minute to fold / unfold the sleeping bag. 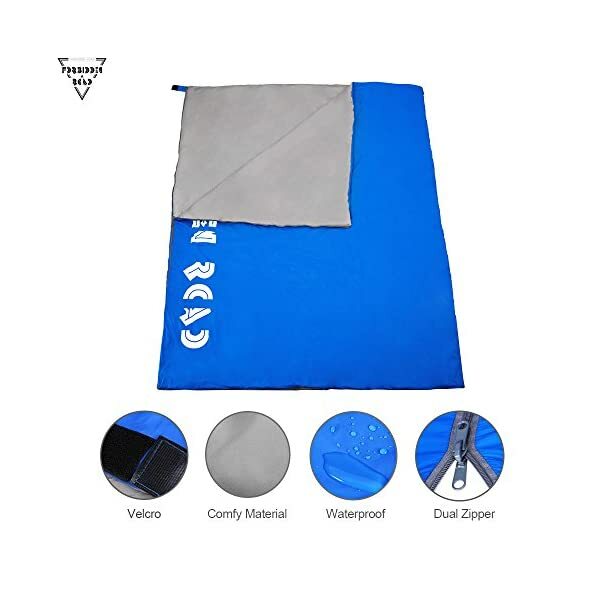 The velcro will also be found at 4 corners of sleeping bag, which is very useful in folding it. 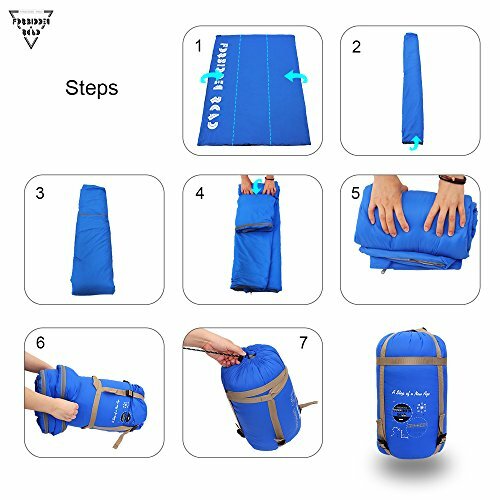 The steps of folding the sleeping bag are shown in the picture. 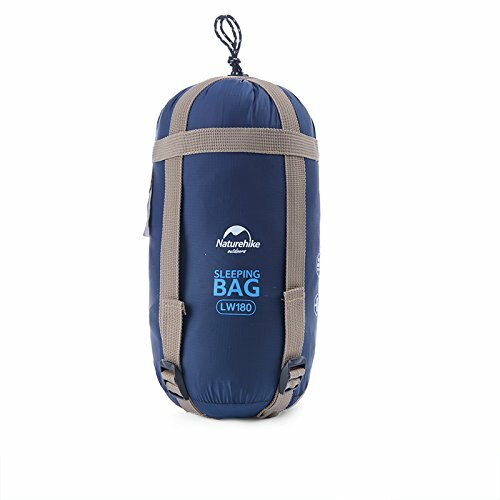 EASY-TO-CARRY : As lightweight of sleeping bag, it is simple to carry to anywhere. 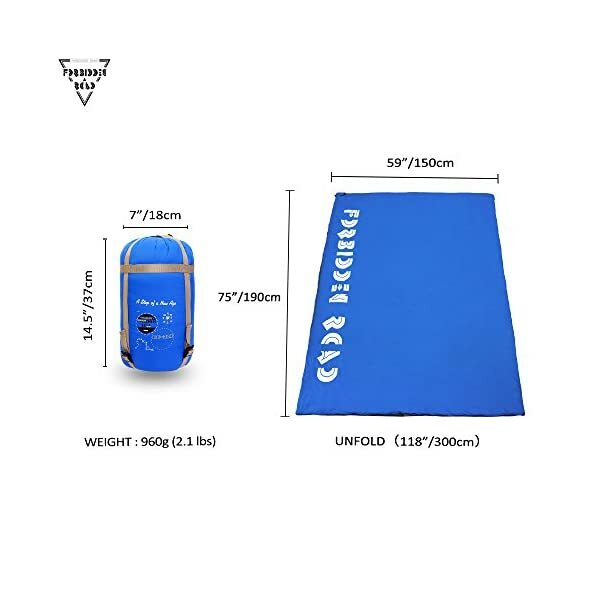 The weight of double sleeping bag is 960g (2.1 lbs). Plus, a free compression bag is included in the package. 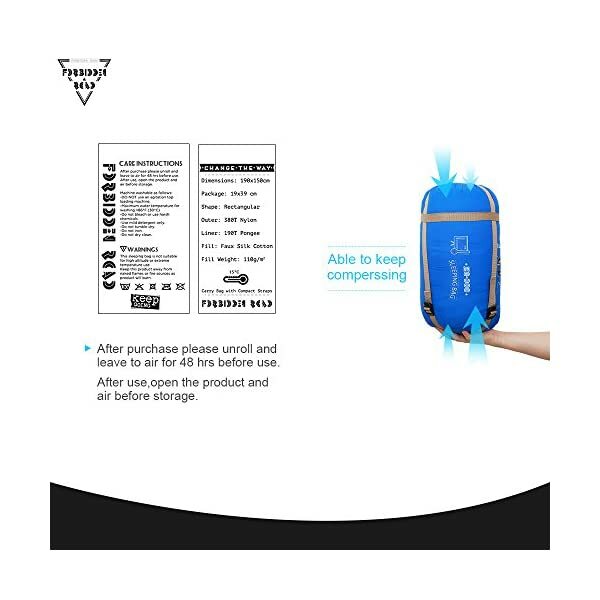 The size of compression bag is 14.5″x 7″ ( 37x18cm ). It is vitally convenient and portable to take to camping / hiking / trip. 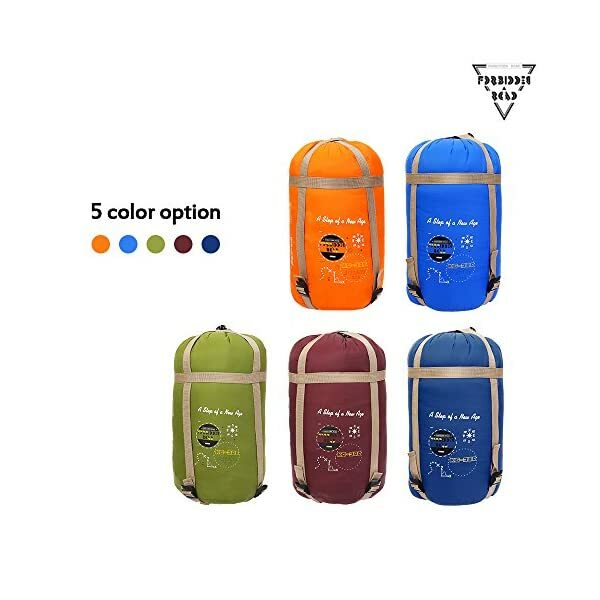 PACKAGE & 5 COLORS : The package includes ONE Sleeping Bag and ONE Compression Bag. There are 5 to be had colors, including OLIVE GREEN, BLUE, NAVY BLUE, ORANGE, WINE RED.